We’re very happy to be launching the new website for Santa Chupito’s this week, a stunning cocktail emporium and bar located on Slater Street in Liverpool city centre. Aptly named ‘the Saint of little drinks,’ Santa Chupito’s prides itself on its intimate atmosphere and their unusual (and equally delicious) drinks. Already a firm favourite in the city, their new, one page website design turns your average night out into a much more exciting experience. Along with integrated Facebook and Twitter feeds, the website creates a collage of photos direct from Instagram, allowing you to share snaps of your favourite cocktails and experiences for all to see. You can also view their full drinks menu online, along with information regarding hiring the venue and bartenders for special occasions. 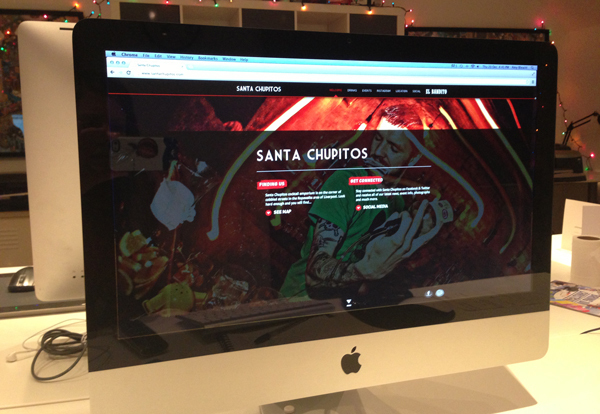 Igoo are also developing the website for their sister bar, ‘El Bandito,’ which is located below Santa Chupitos.